Cleve and Kerry Williams's house in Missouri Heights was reduced to rubble by the fire. Williams tried to save it with six other firefighters, but after that battle was lost they moved on to save other homes. 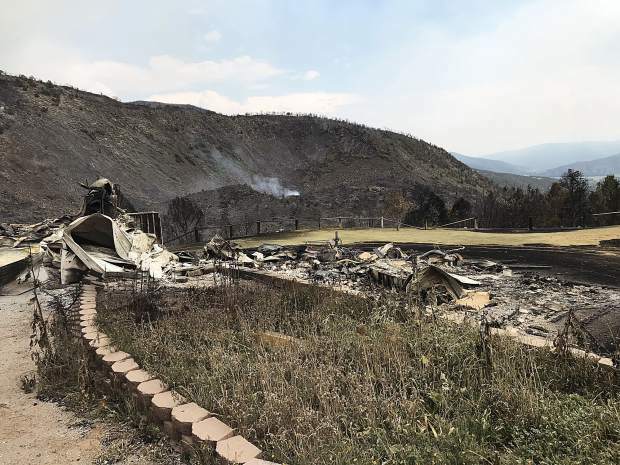 The firefighter who lost his home in the Lake Christine Fire said he was worried about the safety of Basalt on Tuesday night and the El Jebel Mobile Home Park Wednesday night but never felt his house in Missouri Heights was imperiled. Cleve Williams was on the first engine that responded to the fire at the Basalt shooting range at about 6 p.m. Tuesday. The flames were running up the hill to the east. “I thought the battle was going to be Basalt,” he said Saturday in a phone interview. Winds miraculously changed course and blew the flames away from Basalt homes that first night. 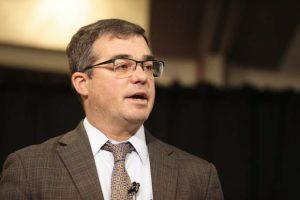 On Wednesday, Williams was out early with a bulldozer going over rough roads under transmission lines between El Jebel and Lake Christine — creating firebreaks and making the roads accessible for vehicles. He later cut another line up the slope from Cornerstone Christian Center before joining colleagues in deciding where to deploy engines and crews to protect structures. Shortly before 10 p.m. that chaotic night, Williams realized the El Jebel Mobile Home Park was in jeopardy. 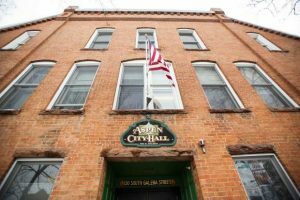 “I figured we’d be losing 15 to 20 homes at least,” he said. But after fighting fires for 27 years with the Basalt Fire Department and as an El Jebel native who knows the terrain intimately, his gut instinct still told him his house in Missouri Heights would be OK.
“I just knew it wasn’t going to get to our house,” he said. So he focused on getting firefighters in place in the mobile home park and neighborhoods to the north. Williams and six other firefighters from Basalt, Snowmass Village and Gypsum along with three engines headed up the hill in a precautionary maneuver. “I was very confident we were going to save the houses,” he said. The fire had something else in mind as it approached the Williams’ house on Vista Hi, the first neighborhood in Missouri Heights on the east side of El Jebel Road/Upper Cattle Creek Road. The fire crested a ridge, crossed a rockslide and made its way to his fire-resistant house that had a metal roof and stucco siding. “The flame lengths were 200 feet long,” he said. Huge gusts would push the flames and force the firefighters to retreat. Then it would die down and let them advance. Sometime around 1 a.m. Thursday he realized the cause was lost. He said he isn’t the kind of guy who panics. He simply made the decision to move on. That next house over happened to be owned by his brother Quent and sister-in-law, Kara. He had advised his brother the day before to mow a field between their houses to impede flames. His small force managed to save the handful of other homes in his neighborhood. Cleve’s house was one of three destroyed by the fire. Kerry Williams, Cleve’s wife, said the fire made her nervous well before invading her neighborhood. “I’m a worrywart by nature,” she said. She consistently called Cleve after the fire started Tuesday and asked if she and their son Cole, 16, needed to leave. She collected important documents, photos and a handful of personal items piled in a hall. She asked Cole to consider what he would want to take and called their daughter, Devin, who attends Cal-Poly, to see what she wanted — just in case. Kerry anticipated they would make a plan of evacuation Wednesday when Cleve took some time off when the fire died off at dusk, as fires tend to do. Cleve was only home for a short time when the fire started blowing up around 9 p.m. They could see the orange glow from their property. Cleve went back on duty and Kerry went back to worrying — with good reason. Cole takes after his dad and doesn’t panic, she said, but he said if the flames reached a certain point, they would leave. They called family friend Temple Glassier to help evacuate with vehicles and soon pulled the plug. She suspected she wouldn’t see her house again. They didn’t have time to load much. She particularly wishes she would had packed some Christmas tree ornaments and a cradle her father made for their first child. They scrambled out among the mix of people rushing from Missouri Heights and checking out the fire. They made it to safety farther downvalley. Kerry and Cole picked up Cleve later that morning at the fire station in El Jebel. The irony for anyone familiar with the situation is Cleve Williams has selflessly given to the Basalt-El Jebel area all his adult life as a firefighter and member of the West Eagle County Search and Rescue. He has skills you can’t teach. He gave nothing short of a yeoman effort fighting the fire that destroyed his home. He got about 30 minutes of sleep Tuesday night. After witnessing his house burn and saving other structures Wednesday, he got an hour of sleep, then he went back Thursday to work eight or nine hours, cutting more fires lines with a dozer. On Friday, the Williams family decided to head out on a trip they had previously arranged with friends to South Dakota. She needed to get away as well. “It got overly emotional for me,” Kerry said. 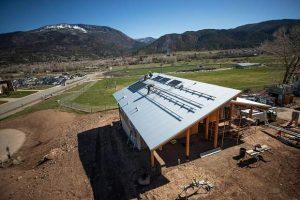 They said they have received an incredible outpouring of support — not only from friends and numerous acquaintances in the Roaring Fork Valley, but people they don’t know. While traveling to South Dakota, they were in a Cabela’s in Denver buying clothes. Cleve was on the phone giving directions to firefighters who needed to know information about the jumbled mix of backcountry roads on the lower slopes of Basalt Mountain. A sales clerk at the store figured out he had been firefighting and struck up conversation, learning they lost their house. She rushed off to find the manager and presented the family with a $500 gift certificate. When she got up the next day, people had donated in excess of $10,000. That account can be found at Cleve Williams Basalt Firefighter, https://www.gofundme.com/cleve-williams-basalt-firefighter. Cleve is a private guy who said he his humbled and grateful for the support but almost finds it embarrassing. “I hate asking anybody for anything,” he said. He credited other firefighters for their efforts battling the Lake Christine Fire, particularly those in El Jebel. “I don’t know how they saved those mobile homes,” he said. The Williamses plan to rebuild. They joked that they would have a clean slate. They commissioned Devin and her boyfriend, an architect student, to begin working on the design.